This book presents Practical Vedanta as the Spiritual Revolution of the modern age for the good of the world. The book is in two parts. Part I summarizes the pioneering work of Vivekananda-Tilak-Aurobindo-Tagore-Gandhi-Tuttle, spread over the last 120 years. Part II is a simplified presentation of Practical Vedanta carrying the timely appeal, in Hindi and English - Arise, awake, move on from spirituality to social welfare, and stop not till you achieve world peace. SATYA P. AGARWAL and URMILA AGARWAL acquired expertise in social science research, at U.S. Universities, in the 1950's. After nearly four decades of interdisciplinary study and applied research at the global level, they brought out the award-winning book "The Social Role of the Gita: How and Why." Thus began a series of innovative research publications based on Sanskrit and Hindi texts. The present publication is No. 16 in the series. I recall a poem my mother wrote two years ago, called "My Life is My Language." This poem, or a "reflection" from my mother of her life, encapsulates her and who she is. In fact, it is a poignant reminder of who my parents are. This poem and hundreds of additional poems, written just like this one, by my mother Urmila, are contained here, in Part II of this book. They serve as a grateful reminder, a kind of beacon of light and hope for our family - a teaching from our mother to us on conducting oneself in life, as she conducted herself in her own life. 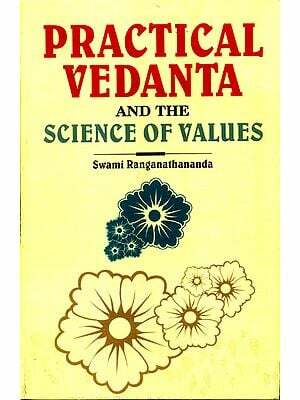 Part I outlines the foundation and development of Practical Vedanta, started by Vivekananda in 1896. Vivekananda's pursuit for creating a harmony between religion and science, coining the phrase "Practical Vedanta", was a desire to create a modem society where the spiritual and the secular would be combined harmoniously in a warm handshake between religion and science. Later writers, such as Tilak, Aurobindo, Tagore and Gandhi exemplify this thinking in their work, spreading the ideas of Practical Vedanta beyond India to activists and writers such as Tuttle and my father. I write this foreword to celebrate my parents' lifelong work, exemplified by their own lives and how they conducted it, inspired by the values of Practical Vedanta described in this book. I am struck by how much they have taught me, and the family. Most of all, they have taught us the meaning of love; love towards all, and the true meaning of dignity for all living beings. The basic principle of human dignity as embodied in the United States Declaration of Independence encapsulates a fundamental aspiration shared by all humankind - the desire, first, to be loved as equals. It's a powerful paradigm that creates a lens through which to see the world around us. Can we truly love others equally as ourselves? Our parents teach us how it can be done. Our paradigms - correct or incorrect - are the sources of our attitudes and behaviors, and ultimately our relationships with others. The term paradigm shift was introduced by Thomas Kuhn in his highly influential landmark book, The Structure of Scientific Revolutions, showing how almost every significant breakthrough in science is first a break with tradition, with old ways of thinking, with old paradigms. In the realm of religion and philosophy, a break with old ways of thinking was accomplished by Swami Vivekananda, when he started the Practical Vedanta Movement in 1897. Vivekananda viewed Practical Vedanta as a way to update and make relevant ideas that have guided our spiritual journey from centuries ago, ensuring their relevance for the new scientific age. Vivekananda's movement was strengthened by Tilak, Aurobindo, Tagore and Gandhi. More recent thinkers, such as Tuttle, are continuing with this movement forward into the 21st Century, with newer practical themes, such as love of all life manifested through a Vegan diet. Similarly, my father's work on Lokasamgraha - the Good of All- and Practical Vedanta is a reminder of the practical significance of ancient teachings from the Gita, Mahabharata and Ramayana for our everyday life and everyday work. My parents, Satya and Urmila, have dedicated their lives to living by the values and principles of Vedanta, and have inspired us - their family - to also live by these spiritual values in support of social welfare and world peace. Their work on Practical Vedanta began early in life. I asked them the secret of their creative thinking so that we may glimpse at those moments in their lives that have helped shape their thinking, and in turn, teach us. ln reply, they mention Gita/ Anu-Gita's five favorable forces - God's grace, parental attention early in life, disciplined life-style free of greed and arrogance, pursuit of vegetarianism and the respect for all life forms, and love and support of family - especially one's children and grandchildren. My parents' interpretation of the 'five favorable forces' guiding their own lives begins with "God's Grace", bringing them strength and fortitude. Mahatma Gandhi always said, "God is Truth", and that truth and non-violence go together in what can be described as "spontaneous adherence to divine principles", as advised by the Gita. After returning to Calcutta, Vivekananda called a meeting of monks and lay devotees on I" May 1897. He told them about his desire to form an organization, which would try to improve the miserable social conditions. After allowing adequate time for consideration, a follow-up meeting was held on 5th May 1897. At that meeting, Ramakrishna Mission was formally established as a non-political organization, with the motto "atmano moksartham jagad - hitaya ca” (working, not only for one's own good, but also for the good of the world). 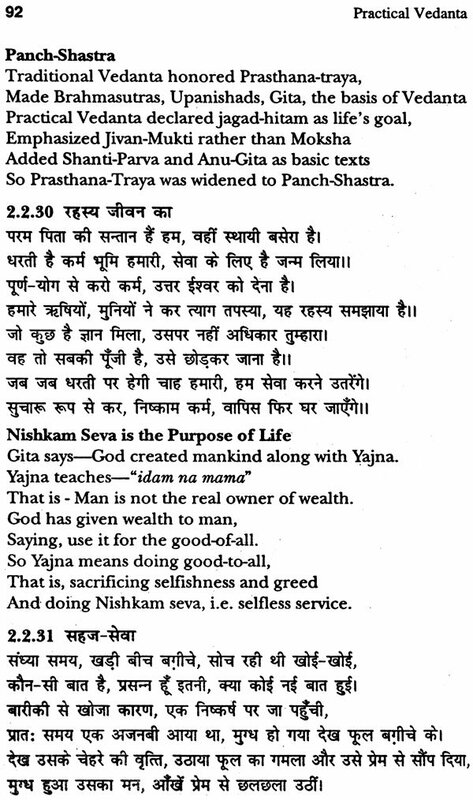 Thus Vivekananda made “jagad-hitam” (good of the world) an integral part of Practical Vedanta. 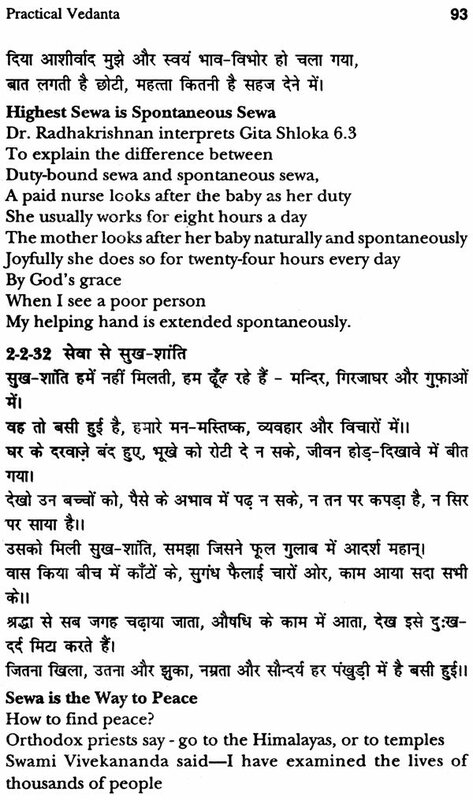 While Vedanta had glorified “moksa” (individual salvation), Practical Vedanta emphasized "social welfare". Obviously, this signaled the start of the Spiritual Revolution of modern India, which won universal acclaim. The concept of "jagad-hitam" (the good of the world), to be effective and meaningful, must include both spiritual and secular aspects, and in due course of time, the welfare of non-humans too. Furthermore, since Ramakrishna Mission was established as a non-political organization, the task of extending Practical Vedanta to the political field was a challenge to be met in the 20th Century. Luckily for the world, Tilak-Aurobindo- Tagore-Gandhi took Practical Vedanta to great heights in the 20th Century. "Jagad-hitam" was their motto too, and they struggled and won the political independence of India, using the Gita as their manifesto. At this point, just a glimpse of these four contributions needs to be given. (a) He wrote "Gita-Rahasya or Karmayoga-Shastra" - a detailed commentary on the Gita, which has been recognized as both scholarly and revolutionary; and (b) He revolutionized the political ideology of the Indian National Congress, and he was the first political prisoner in 1897. 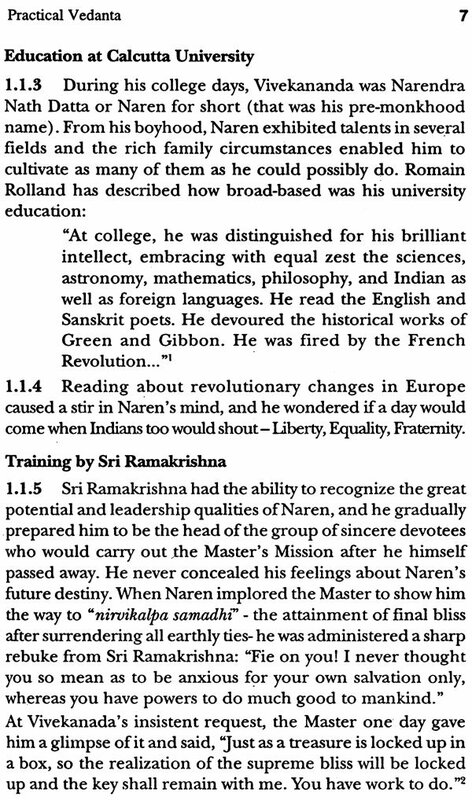 Aurobindo supported Tilak in the freedom struggle till 1910, when he went to Pondicherry. 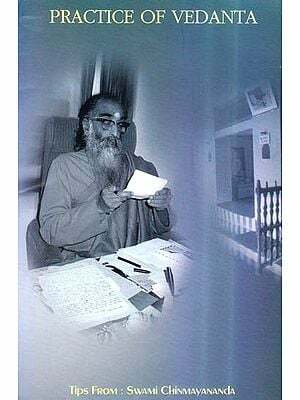 There he wrote his famous Gita commentary entitled "Essays on the Gita". 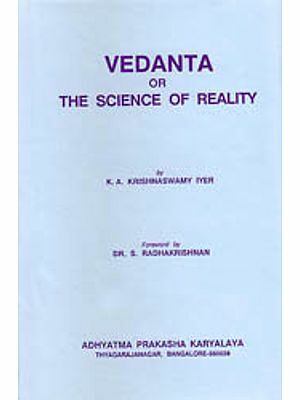 Among the many outstanding features of this book, the one which is particularly relevant for our purpose, was his scholarly opinion against the "jagad - mithya" doctrine of Traditional Vedanta. Earlier, the promotion of "Jagad - hitam" had implicitly rejected "jagad - mithya". Then no door is shut. in the play of the many. " among the poorest, the lowliest, and the lost." Tagore's "Shanti-Niketan", and worldwide travels for the cause of peace-oriented education was widely appreciated as the poet's strong appeal for world peace during the first forty years of the 20th Century (i.e. before the establishment of the United Nations). "Tagore's deepest regret, when he approached the date of his death in 1941," writes U ma Das Gupta, "was that his work of village reconstruction could not remove social injustice. He put his absolute faith in Gandhi's leadership to help the destitute millions." Gandhi became the world-recognized champion of the Vedantic message of Ahimsa, to which he gave a path-breaking socio-political role. His successful campaign for the cause of human rights in South Africa during 1906-1914, earned him honor as "Mahatma". Through his non-violent confrontation with the British authorities in India, he encouraged women also to play a significant role-thus promoting the cause of women's empowerment. He risked his life, while attempting to remove the centuries-old curse of untouchability. He also promoted vegetarianism. In the beginning of the 21st century, Western scholars and activists (drawing inspiration from Vedanta and other philosophies) have taken the lead in further updating of Vedanta, by attaching high priority to the welfare of nonhumans. 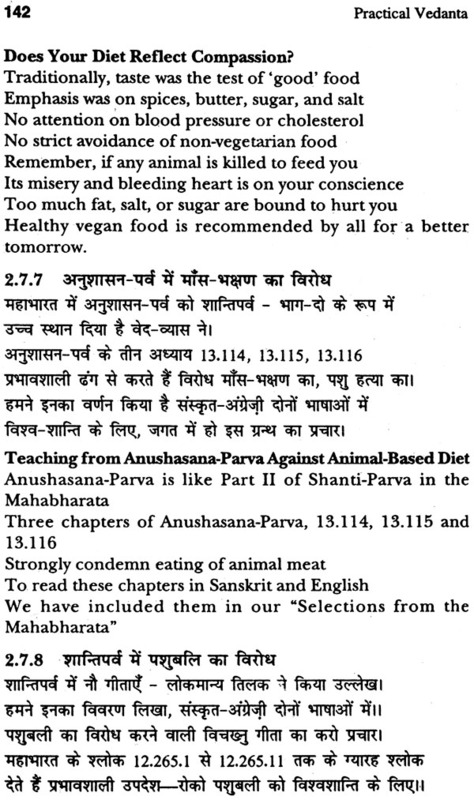 This has been done by means of "veganism", which is non-dairy vegetarianism. With the publication of the book "The World Peace Diet" in 2005, Will Tuttle's bold initiative has acquired the effectiveness of a revolutionary campaign. Through his work, Tuttle is contributing to global efforts in the cause of climate change and world peace. This book is divided into two parts. Part I is entitled; "Spiritual Revolution for the Good of the World." It contains six chapters, describing the work of various Vedantins who have inspired my parents. This is a big subject and many Vedantins have made (and are still making) significant contributions. Chapter 6 of Part I marks the beginning of an effort by a 21st Century Vedantin, Will Tuttle, who is focusing on the issue of a vegan diet for a more compassionate and peaceful world. Part II is a presentation on Practical Vedanta through poetic reflections written originally in Hindi by Urmila Agarwal, their English meaning drafted by Seema Agarwal-Harding and subsequently the reflections and their meaning given shape by both the authors - my parents. For the convenience of readers, the Hindi version is accompanied with its simplified meaning in English (not a strict translation).